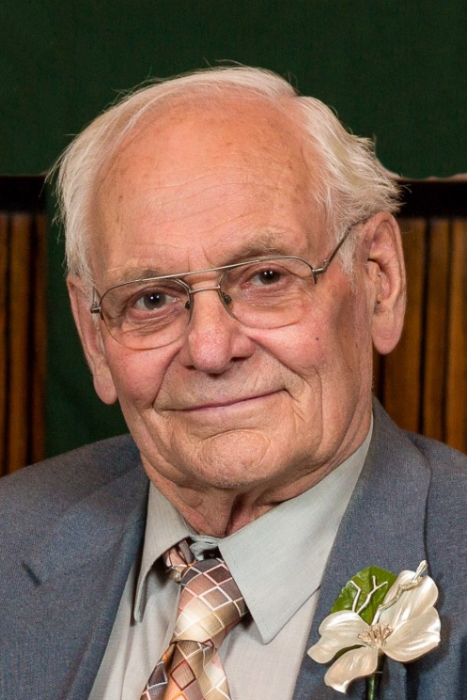 Lyle James Rossman, age 81, of Watertown, SD, passed away on Tuesday, January 29, 2019, at his residence. Funeral Mass will be at 11:00 a.m. on Monday, February 4, 2019, at Holy Name of Jesus Catholic Church. Fr. Michael Wensing will be the celebrant. The family is requested to meet at the church by 10:30 a.m. on Monday for a family prayer service. Visitation will be at Crawford-Osthus Funeral Chapel on Sunday from 1-3 p.m. and also prior to the service at the church on Monday. Burial will be on Monday at 2:00 p.m. at Hillcrest Cemetery in Estelline, SD. Active pallbearers will be Lyle’s grandsons: Joshua Rossman, Nicholas Rossman, Matthew Clarke, Michael Clarke, Benjamin Cahoy, Mason Cahoy, Dylan Newby and Dustin Newby. Lyle was born on February 18, 1937, to Raymond and Edna (Benz) Rossman, in Brookings, SD. He attended country school by White, SD and graduated from White High School in 1955. Following graduation Lyle enlisted in the U.S. Army and was stationed in Oklahoma. He was honorably discharged after a year in Korea. Lyle helped his dad on the farm after his military service. On October 25, 1958, Lyle was united in marriage to Barbara McClard in Estelline, SD. He worked for Watson station in Brookings before moving to White in 1959, where he farmed with his father until 1964. Lyle was a student in the first class of Lake Area Vo-Tech in the Office Machine Repair course. He then worked for Cook’s Office Machines. Lyle was employed as the instructor of the Office Machine Course from 1966 to 1973, when they closed the course. In 1973 the family moved to Estelline where Lyle started his own carpentry business of remodeling and building. He also taught his children how to be handy and also his remodeling skills. During the Estelline years Lyle was on the school board, Estelline Commercial Club, 13 years on Ambulance, the school booster club and a member of St. Francis Church. The couple moved to Watertown in 1988 and Lyle continued with his carpentry for others along with their own rental properties. Lyle was a member of Holy Name of Jesus Catholic Church but would watch the TV Mass the past few years. He very much enjoyed attending all of the music and athletic events of his children and of his grandchildren. Lyle enjoyed visiting his brothers and sisters every July and the McClard family in May. Our friends have meant the world to us in the past few years while Lyle was mostly homebound. Lyle is survived by his wife, Barbara, of Watertown, SD; his children: Roxane (Tim) Clarke of Sioux Falls, SD, Robin (Chad) Cahoy of Mitchell, SD, Les (Jill) Rossman of Watertown, SD and Lisa Rossman Newby of Parker, CO; 11 grandchildren; 11 great-grandchildren; his brothers: Robert Rossman of Olympia, WA and David (Mary) Rossman of Omaha, NE; and his sisters: Mavis Miller of Lakeside, CA, Pat (Dennis) Hakeman of Placentia, CA and Shirley Nagle of Kempner, TX. In lieu of flowers, the family requests that memorials be made to the “Suzanne Jacobson Memorial Fund”.